Workshop participants conducting a “vulnerability assessment” exercise to define future conditions that could potentially “break” the system under consideration. Photo credit: Guillermo Mendoza. Leaders from USAID, Thai water resource agencies, local universities and major non-governmental organizations (e.g. 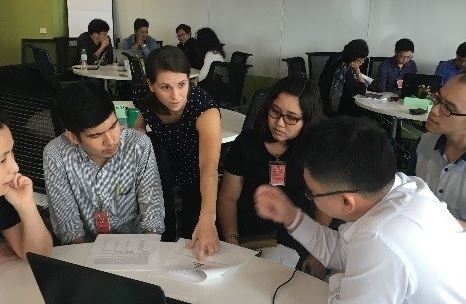 the United Nations Development Program, Mekong River Institute) attended a two day Collaborative Risk Informed Decision Analysis (CRIDA) training workshop lead by an ICIWaRM team. The workshop took place on September 25-26, 2017 at the Asian Institute of Technology, outside of Bangkok, Thailand. CRIDA provides a framework for water resources planners through which deep uncertainties are assessed, vulnerabilities are identified and plans for mitigating future risks are made. CRIDA is an approach that has been developed over the past decade by a team of researchers from the US Army Institute for Water Resources, University of Massachusetts, the World Bank, Deltares and other institutions.risks are made. CRIDA is an approach that has been developed over the past decade by a team of researchers from the US Army Institute for Water Resources, University of Massachusetts, the World Bank, Deltares and other institutions. Workshop participants and ICIWaRM training team. Photo credit: Guillermo Mendoza. The participants identified a need for a more in-depth, week-long CRIDA training for USAID officers and Thai water resource agencies (e.g. the Royal Irrigation Department and Ministry of Natural Resources and the Environment). There is great interest in applying CRIDA in the planning process across sectors and organizations.